Here’s a bit of a quickie review to end the week. Over the years I’ve dipped in and out of Jo Malone’s catalogue of fragrances. For the most part I find them to be well-executed scents that range from clean easy-pleasers like Lime, Basil & Mandarin and Earl Grey & Cucumber etc. to more intriguing oddities such as Rain & Angelica and Wood Sage & Sea Salt (there’s also that upcoming Incense & Cedrat that I keep saying I’m obsessed – more of that soon). They may not necessarily be the first brand that I’d go to if I was looking for a wild and wacky fragrant adventure, but I’m always keen to see what the world of Jo Malone has to offer. As they often do, Jo Malone have launched a collection of limited edition fragrances. This year, the theme is British history and the name of the game is “Rock the Ages”. Charting British tradition from the Tudor era to the present day the five fragrances (four new ones plus a limited edition bottle of popular fragrance, Pomegranate Noir) map the many facets of our vibrant history. Birch & Black Pepper (perfumer: Christine Nagel), the subject of today’s review is the one assigned to modern Britain, to 2015 specifically, and it’s described by the brand as being “individual, audacious and stylish”. Birch & Black Pepper is pretty interesting from the get go. It opens with lots of savoury, smoky and salty birch, as billed, but there’s a translucent airiness, thanks to the almost aquatic spice of cardamom, that stops anything from being heavy or oppressive. The pepper is relatively subtle, crackling softly in the background and giving off a metallic glow. My favourite part though, is the inky heart that is deep black and floral (white florals, most definitely). It gives what would otherwise be a standard spice scent, a unique depth that carries right through to the base. Birch & Black Pepper displays modern Britain through smoke, spice, metal and ink. It’s a handsome picture for sure. I’m not going to lie to you, I wasn’t particularly overwhelmed by the idea of Birch & Black Pepper. Sometimes you just get the feeling that a scent won’t be for you, and the mix of notes didn’t sound appealing to me. How wrong was I? This is an incredibly well-thought-out fragrance that presents spice in a transparent, shimmering and floral package that is really easy to enjoy. Also, as with many of the Jo Malones, its great to layer with. I paired it with Annick Goutal’s Eau de Ciel, and the result was musk, flowers and spice – heaven. Birch & Black Pepper is a limited edition available in 30ml Cologne for £42. 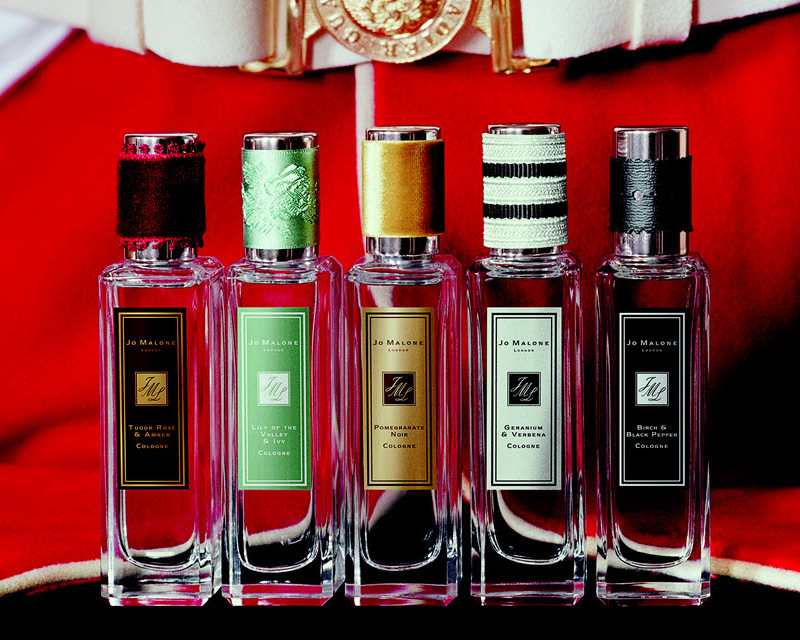 Sample, notes and quotes via Jo Malone. Image 1 via elle.ru. Image 2 via fragrantica.com. Posted in Jo Malone, Perfume Reviews, Spicy, Unisex and tagged Birch & Black Pepper, Cologne, Fragrance, Jo Malone, Limited Edition, Perfume, Perfume Review, Rock the Ages. Bookmark the permalink. Sounds like a nice, wearable take on birch tar. Your own fragrance combining sounds even better! Incense and Cedrat is the one that really appeals though. Look forward to your review and trying that at some point – I don’t often say that about Jo Malone. It really is. I was quite surprised. I normally get bored of birch tar after a couple of hours. It sort of drones on with relentless heaviness. This is transparent and luminescent. I’ll put some Incense & Cedrat in a spritz for you. Love the review. Completely mesmerized by the scent as well. I appreciate the stylish edge of Jo Malone London recently! They’re definitely becoming more edgy. I like it! I can go along with wishy-washy. Nicely done, for the most part though. They’re getting a bit more niche, which I like. I don’t think we’ll ever see anything particularly challenging from them but the game is being stepped up, and their recent output has been interesting. This sounds pretty interesting!Although I’d first like to get my hands on the Geranium+Verbena! Oh! !and LotV and Ivy! !sounds really interesting!! I’d like to try that one too! I am dying to try them! I have only tried this one and Pomegranate Noir. Would definitely like to try the others too. Let me know if you do give them a sniff. Will do! I like Pomegranate Noir even though I typically shy away from fruit scents. Will see if I can get my hands on the rest! Try Jo Malone in store.